This penthouse could be described by one word that every property owner (and real estate agent) loves: location, location, location! Situated just in front of the Mercat de Santa Caterina, the terrace of this apartment is spoiling the eye with fantastic views over the el Ribera´s market to the left, and the Cathedral, together with the square in front, to the right. On the downside, the building is dating from the 60s and on a first look anything but beautiful. However, upon the second look the house has several beautiful details that served as starting point for our design proposal. The owners brief was quite simple. They wanted to use the apartment as a holiday residence and so include three bedrooms, one of them being a master bedroom with ensuite bathroom. Furthermore an open living space that includes the kitchen. Since the structure of the building allowed changes in its distribution easily, we reconfigured the entire apartment to fit the functional program into the given footage. We took inspiration in the international style, especially the architecture of the bungalows so fashionable in the 60s. Our first intervention was to level the living room with the outside terrace. Another important decision was to connect the kitchen with the dining area, and get rid of the entrance hall to gain maximum space. We then inserted a functional wall, that includes shelving for the living area, the backdrop of the kitchen, and access to a little pantry. This wall is done in American walnut and continuous all the length of the hallway. The other main material we used was marble. Green marble for the en-suite bathroom, brown marble for the kitchen and guest bathroom. The kitchen isle was done in silestone for easy use. 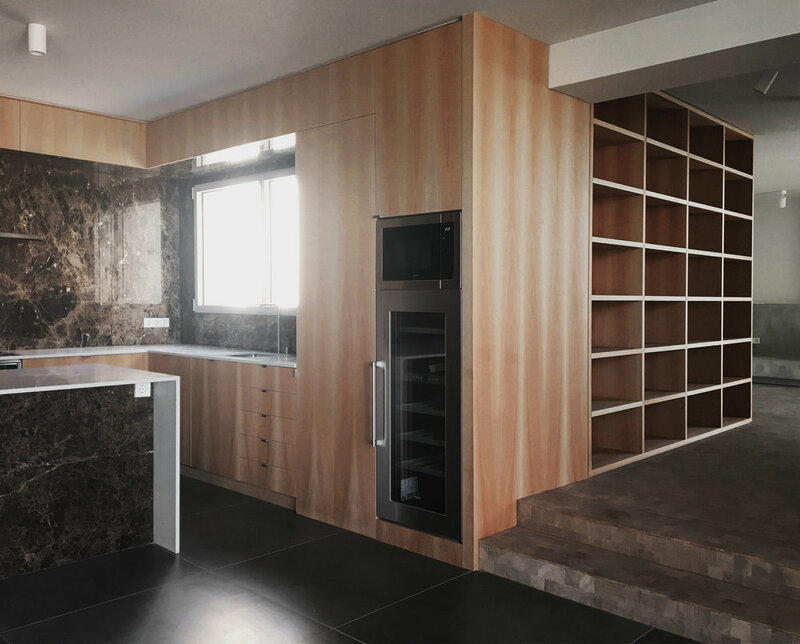 The floors are either executed in small oak tiles, or large formatted grey ceramic tiles. We worked with lots of built in furniture to create enough storage space without filling the spaces with furniture. This helps to create this clean-lined and calm ambience that one so appreciates of the international style. 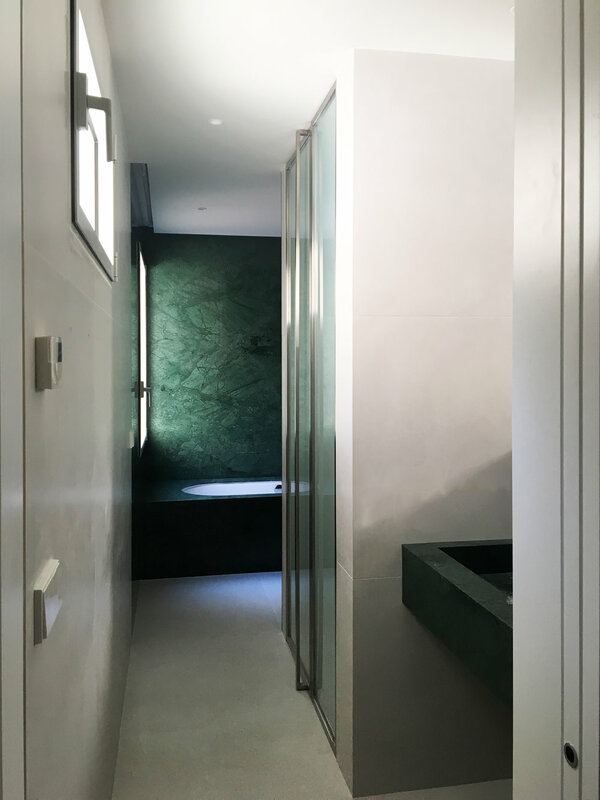 Overall, the continuation of the building´s modern architectural heritage, the openness and clarity of its spaces, and the careful detailing created a delicate project, which at the same time works as the perfect home from home for the owners.